Write On, Dude is one of Kat and Ana's microgames in both WarioWare: Touched! and WarioWare Gold. The name is a pun on the phrase "right on, dude". 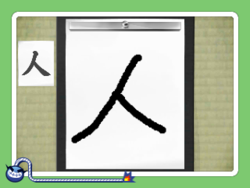 The objective of the game is to trace the lines to write the kanji shown above. Players have to fill in as much of the outline as possible without straying too much from the pattern, or else they lose the microgame. This microgame lasts twice as long than usual, as players have to be careful while writing the character. 1st level difficulty: There is a simple character (2 or 3 strokes) to trace. Possible kanji are 力, 大 and 女. 2nd level difficulty: There is a slightly complex character (4 or 5 strokes) to trace. Possible kanji are 円, 牛 and 穴. 3rd level difficulty: There is a complex character (4, 5 or 6 strokes) to trace. Possible kanji are 王, 毛, 玉 and 任. The kanji recognition is somewhat fuzzy and could recognize 王 as 玉. The objective of the game is to write the kanji shown to the left. 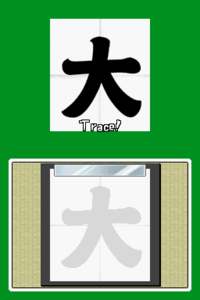 Unlike WarioWare: Touched!, there is no outline to trace and there are a lot more different possible kanji to write. If the player successfully writes the kanji, the meaning of the kanji appears above the written portion. 1st level difficulty: There is a simple character (2, 3 or 4 strokes) to write. Possible kanji are 下, 火, 犬, 口, 山, 上, 人, 川, 太, 大, 土, 刀 and 力. 2nd level difficulty: There is a slightly complex character (4 or 5 strokes) to write. Possible kanji are 王, 弓, 牛, 玉, 兄, 石, 毛 and 木. In the Japanese version, possible characters are 毛, 金, 肉, ひげ, さる, and まめ. 3rd level difficulty: There is a complex character (4, 6, 7 or 8 strokes) to write. Possible kanji are 金, 月, 耳, 足, 肉 and 米. In the Japanese version, possible characters are 三本, 水虫, 本名, 正気, 入会, 人生, 天才, 山田 and ラツコ. ↑ さわるメイドインワリオ ずかん攻略 カット＆アナ. Retrieved February 8, 2017. This page was last edited on March 19, 2019, at 02:00.